OK, having said that, let’s proceed with this week's lessons and we’ll have a little game at the end. Enjoy! Once we covered the basics of pronunciation, we started a new course in reading, which we finished a couple of weeks ago. Following some recent requests, we started a section on educational games, to add the fun into your learning. I do hope you like these. This is an easy topic, especially when you acquire your English, rather than learn it methodically. People acquire a language by learning it from their parents, or by living in a country in order to learn the respective language, instead of taking a systematic approach, like we do in school. Learning from films is also a method of acquiring a language and we all use a combination of these means at times. These are easy expressions to learn and memorise, but let me briefly explain to you the logic behind them. If it’s a hypothetical preference you need to express (a theoretical one) you need to use 'would prefer' with a 'to- infinitive'. However, this can be replaced by 'would rather' with the bare infinitive (without to), which may be followed by a 'than-construction'. That’s all there is to this matter – the rest is practice. Lots of it, as well. Right, my friends, we have reached the point of designing a website and I started introducing the SBI system [Site Build It system] in our last lesson. 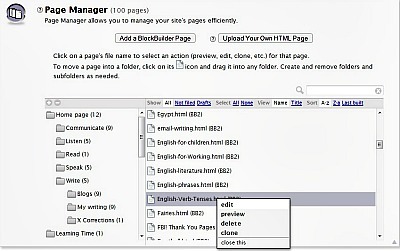 Unfortunately, I couldn’t show you anything visually at that point, but let me share with you here the tools involved in building and maintaining a website with SBI – a system that not only gives me the tools to do such a marvellous thing, but also taught me how to use them, in a comprehensive course (which I’m sharing with you now), and it has the resources to address any little (or big) problem I may have in the process. We are like a worldwide village of people doing our business online and helping each other to prosper. 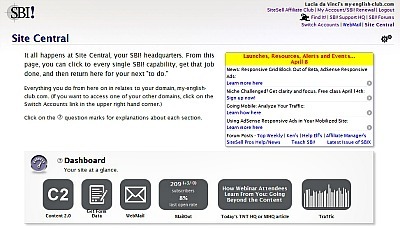 I’ll share with you the ‘behind the scene’ website – the Site Central page of the SBI system, starting today. It would take too much time and space here to present it all in once, if we were to do it justice, so I decided to take it step by step, until it’s done. I shall give you bite size aspects of the system, thus avoiding posting another long and boring lesson here. I can’t even call the Site Central “the driver’s seat” – it’s the “pilot’s cockpit”; such complexity, fitted into a compact space like this (one page) is more like a space ship than a car. This is the place where everything happens, from the early conception stages, to the social media stage and monetizing. It’s all very organised, with my links to the other pages of the ‘engine’ at the top-right corner: I can go to the forums, my webmail, my affiliate club, the support HQ (Head Quarters) and other resources in Find It. Under that I have the Dashboard, which is a new and very useful addition, giving me information at a glance on your submissions – either content (stories you write in, using the forms you find on the website), or exercises you fill in on other forms, and even your subscriptions to the e-zine and the Club itself. At this moment in time, it tells me that there were 3 new subscriptions since our last e-zine, no cancellations and that 8% of you opened my last e-zine, which makes me wonder if I’m wasting my time writing these lessons or not. But, even so, life goes on and I keep sending you my information, enjoying those feedback emails in the meanwhile, confirming that some of you appreciate them. Thank you, my friends, that means a lot to me – it defeats the writer’s loneliness factor, if you know what I mean. Underneath the Dashboard you will find the Brainstorm It!, which includes the brainstormer, together with the MKL (Master Key List) and the Niche Choose It - exactly the tools we use for searching, calculating and selecting the keywords to use within the website you're planning to build. We introduced the Brainstormer in Issue 020 and we looked at how it works in depth, in Issue 021 , so we won't go into the details of this system today. I think this is enough for a lesson about the tools for building a website right now - we shall continue with some even more exiting facilities of the SBI! system next time. 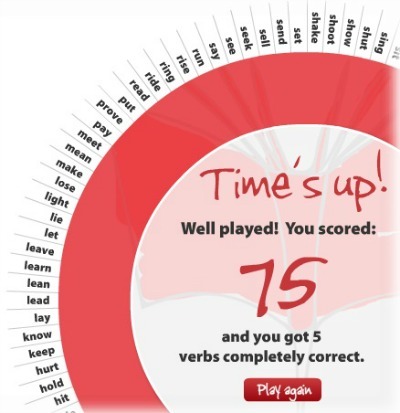 Irregular verbs are tricky and inconsistent - that’s why they’re called ’irregular’. 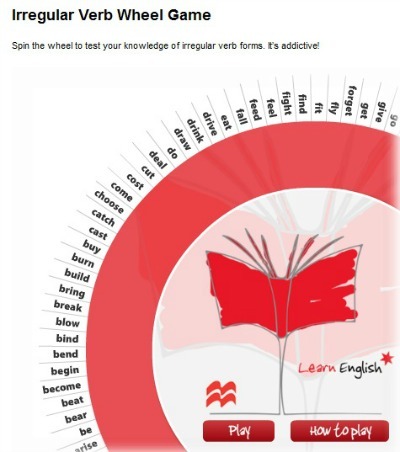 You can practise conjugating irregular verbs by spinning the irregular verb wheel. Some are easy and some difficult, but how fast can you conjugate correctly? The rules are simple: We have a wheel with verbs on its edge, from which a verb is chosen at a time, at random. 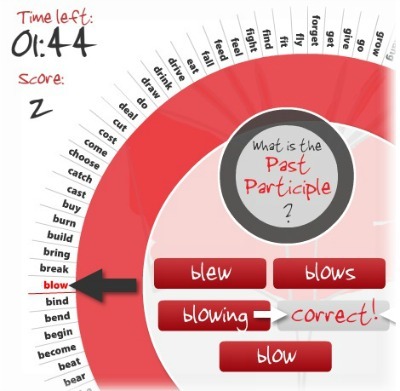 A few question will then appear, asking you mainly to choose the infinitive of that verb, the past simple tense, the past participle, the –ing form, and the present simple for he/she/it from a selection of forms of the respective verb which is given inside the wheel. You get 1 point for every correct answer and a bonus of 10 points if you answer all five questions for a particular verb correctly. Who says that hard work goes unrewarded!? This is my score for today. Now, I dare you to play and beat me. Will you write back when you win? Enjoy playing in the meanwhile.